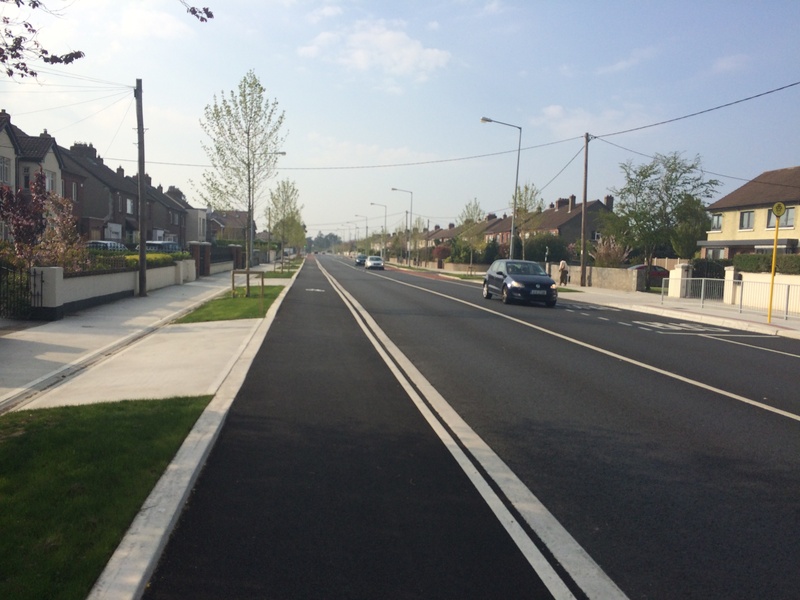 We’ve been anticipating the completion of the Braemor Road Enhancement Scheme in Churchtown for some time. It’s not yet complete, so we’re previewing rather than reviewing it. Once the project is finished we hope to return to the road at rush hour to see what it’s like under those conditions. The scheme includes cycling, walking and general surface upgrades to the road, as well as an increased area of green space and replacement trees. This revamped section of the route is under 2km in length… so, what’s to get excited about? 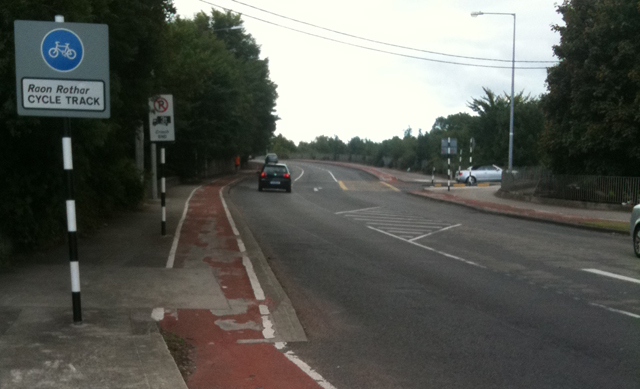 When Dun Laoghaire-Rathdown County Council proposed the enhancement scheme our interest was spiked because we had highlighted the route as one of the worst cycle routes in Dublin — see our old westbound and eastbound images on flickr. The route used to include broken red surfaces, trees causing bumps in the cycle path, large sections of narrow widths, sharp turns, poor shared use with cycle track lines painted on footpaths, and obstructions including branches and polls. The now near-complete project is designed to fix all of those issues — it seems to succeed in doing so. The below image shows a typical cycle path section of the route — mostly 2 meter cycle paths (plus kerb width), beside 3.5 meter traffic lanes on a 50km/h road. The cycle path is wide, continuous, and smooth. The transitions between cycle path and cycle lane at junctions and other locations are almost unnoticeable. The widths provide for easy overtaking of single cyclists, and Dutch- or Danish-like social cycling beside your friends or family. 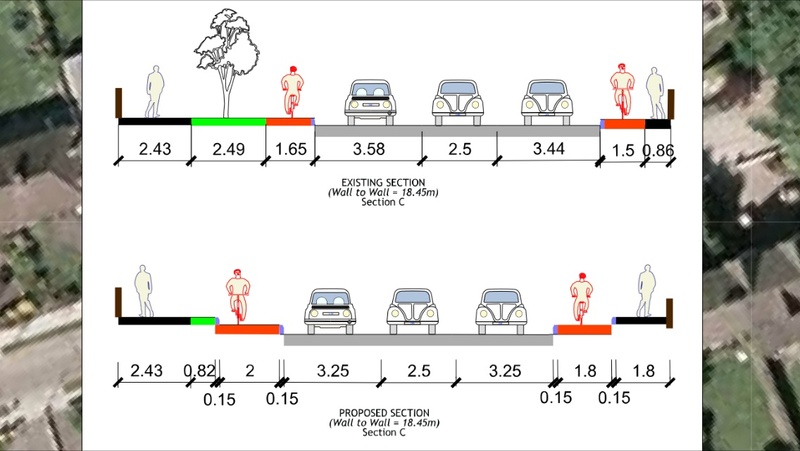 The two cross-section drawing below show example improvements — the drawings show how in one case a shared surface footpath with a 1.5 meter cycle lane and less than a meter left for pedestrians is now change to 1.8 meters each for pedestrians and cyclists. The width of both, however, is generally 2 meters or more. How was the extra widths achieved? Traffic lanes were standardised and in some cases narrowed to suit conditions; in some cases, turning lanes into housing estates were removed, and in other cases trees or grass margins were moved or narrowed (again: the council says overall there’s extra green space). As a through route, the newly revamped section of this route seems to be fantastic by Irish or UK standards. Line markings have yet to be put in place in some locations, such as this junction pictured below. Note how the path becomes a broken lined lane (cars can legally enter) before the junction. And even with a segregated cycle path, an advance stop box / line for cyclists is being provided for — there is no right turn here, so maybe it’s for stacking? Bus stops interrupt the cycle path. Not just at the bus stop, but, in advance of most bus stops, the cycle path becomes a cycle lane. If it was not for the bus stop layout we would have far higher praise for the project — we would be calling for the project to become a standard bearer. This approach might be better than than the cycle path going over the bus stop, but there is another option: The Netherlands use an alternative design, dubbed “bus stop bypasses” — you can see examples and read up on these at bicycle blogs A View from the Cycle Path and Bicycle Dutch. To us, there seems to be space for bus stop bypasses at most locations. Bus stop bypasses are standard in the Netherlands, it was one of their starting points for segregation even where the rest of a road had unsegregated cycle lanes — we now need to look at making them standard here. This issue of bus-bicycle interaction cannot be understated when it comes to perceived or subjective safety which needs to be tackled to make cycling attractive to most people. Were the many driveways along the route seen as a blocker to bus stop bypasses? Did the council not want to eat into the green space and suitable place for trees? Would utilities need moving? Was cost a factor? Another question we don’t have the answer to is: Could right turns for cyclists have been done better? This is an example of a general right turn with no apparent provision for cycling and the kerb makes joining the general traffic a bit bumpy. The project also includes elements such as this speed ramp or ‘table’ at side roads. But it could have been preferable to continue the footpath level across the junction? 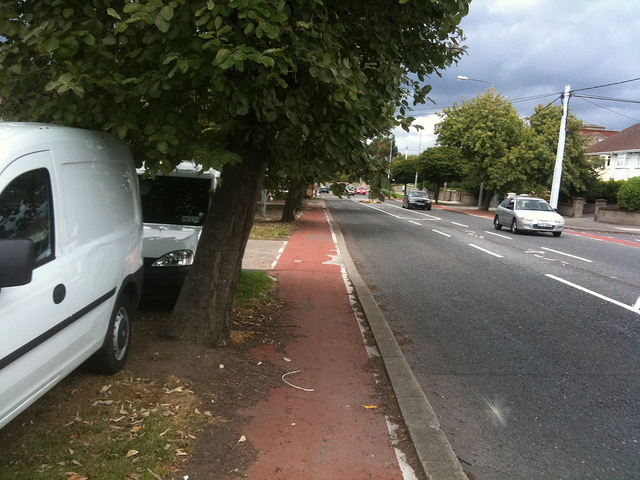 This is often done in Denmark and the Netherlands, and as shown in the Irish Manual for Urban Roads and Streets. An example used in the Irish manual is Dorset Street which uses high-quality and high-cost finishes, but Parnell Street does the same thing using tarmacadam — the exact finish as below, just level with and fully joint to the footpath — drainage issues can be overcome. Bus stops interrupting the cycle path: Not just at the bus stop, but in advance of most bus stops the cycle path becomes a cycle lane. Bus stop bypasses are standard in the Netherlands, it was one of their starting points for segregation where the rest of a road had unsegregated cycle lanes — we now need to look at making them standard here. Provisions for cyclists turning right: At some main junctions, as well as minor or estates side roads. The use of toucan crossings without segregation paths to/from these crossings is a form of pedestrianising cycling. But it has to be accepted that the project had many constraints. These include a public disquiet of losing mature trees (even if that issue was not as clear-cut as some think as we covered before); an apparent lesser issues of losing some traffic turning lanes; dealing with buses and private traffic; the many driveways along the route; and things like the varying wall-to-wall widths of road. 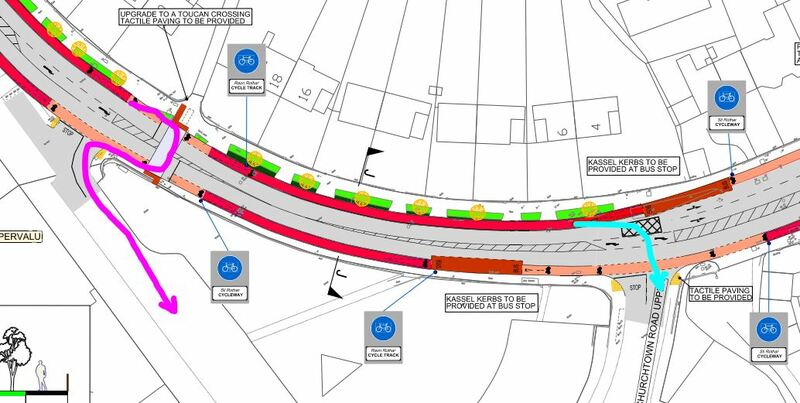 In that context, the project might not be perfect, but Dun Laoghaire-Rathdown County Council look to be creating one of the best stretches of cycle route in the country. As a regular commuter along this stretch, the transformation has been a delight. After cycling on the main carriageway in wet windy conditions fearing for my safety from close passing traffic, I can now cycle safely with plenty of space and a safe distance from traffic. I am wondering about the long term longevity of the materials forming the Cycle path is it good stuff and wont breakup over time. That red stuff on most Cycle paths is not lasting and is not nice to Cycle on in this condition. Apart from that it looks very well,it is extremely rare that I am in the area however so I wont know how good it is. I shall have to rely on the previous responder Tomás and other users for their input. Good article. It illustrates that even for a relatively straight-forward improvement scheme, the particular challenge of designing for cyclists is always the most difficult to get right. 1) The Dutch system drops the cycle track surface relative to adjacent footpath and verge. This allows the cycle track to be constructed level and without ramping. Intersections with minor road crossings can then be smooth and seamless. 2) With the Dutch system, the cycle track would then be a proper off-road facility and not the hybrid system provided, whereby cyclists are brought on-road at junctions and at bus-stops – locations where they are most vulnerable. 3) It is more pleasant and feels safer to cycle separated from the road by a verge. 4) The cycle track is less likely to be blocked by parked cars: the “raised adjacent” cycle track as provided, is too easy for a driver to pull up on. 5) Because of the above, the cycle track pavement surface will become uneven over time. 6) Bringing trees closer to the trafficked carriageway, visually narrows-in the roadway and helps to traffic-calm the street. It currently looks like a wide “fast road”: the black-top adjacent cycle tracks visually merges with the road pavement and gives comfort to the driver to go fast.